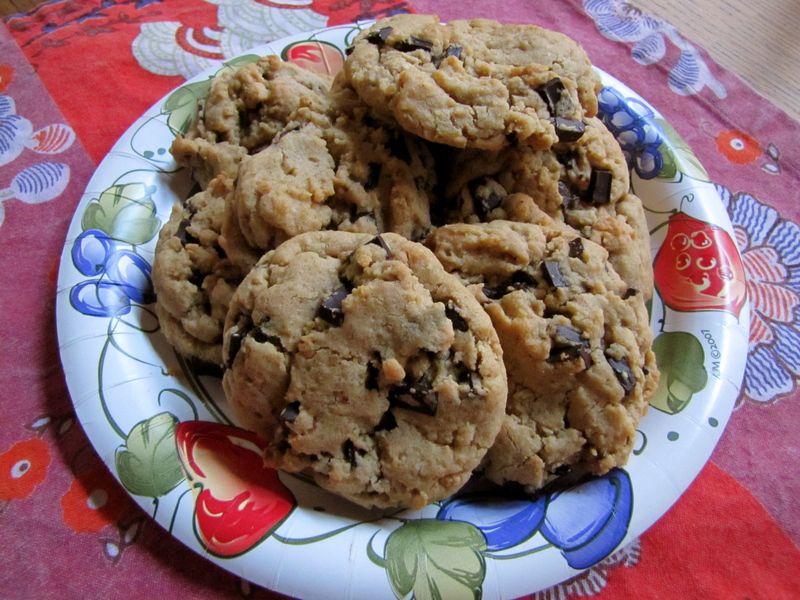 Peanut Butter Oatmeal Chocolate Chip Cookies – Voila! Fresh out of the oven these cookies are gooey, delicate and delicious. You might think they’re not done, but they are. Let these gooey cookies sit on the baking sheet to cool and finish baking (since the baking sheet is still hot) and you will be very happy with the results. The next day, they’re still great! The caveat: everything I said above is true, if you like peanut butter in your cookies. I realized it’s not my favorite. So my colleagues and husband were my test subjects, and as people who do like peanut butter in their cookies, they loved ’em! 1. Whisk together the flour, baking soda and salt; set aside. 2. On medium speed, cream together the butter, peanut butter, granulated sugar, brown sugar and vanilla extract, about 3 minutes. Add the egg and beat to combine. On low speed, gradually add the flour until just combined. Stir in the oats, and then the chocolate chips. 3. Use a large cookie scoop (3 tablespoons – I just overloaded a tablespoon) and drop dough onto prepared baking sheets about 2 inches apart. Bake for 10 minutes, or until the cookies are lightly golden. Cool completely on the baking sheet and then store in an airtight container at room temperature. Pingback: Citrus Pound Cake | Voila!